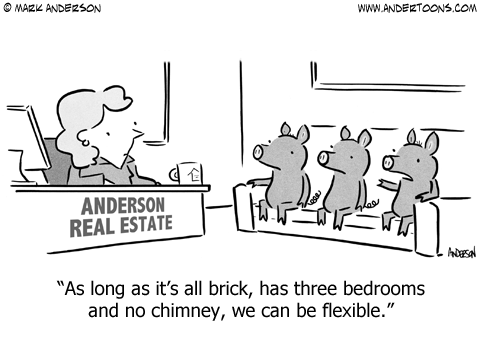 Looking to buy a new home? This calculator will help you determine which home loan option is better: fixed rate mortgage or adjustable rate mortgage (ARM). The calculator will consider both fully-amortizing and interest-only ARMs. Input the necessary information pertaining to your prospective home loan, including information for a fixed-rate mortgage, a fully-amortizing ARM, and an interest-only ARM. If you are in the market for a mortgage, you want to get the best interest rate. Some of the adjustable-rate loans look very tempting when compared to fixed-rates. You may be asking yourself if gambling on an adjustable-rate is a good option. You also might be confused as to the difference between these two. Read on to understand more about fixed and adjustable loans, specifically when they pertain to a mortgage. A fixed-rate mortgage is a loan that has the same interest rate locked in from the beginning to the end of the term. If you have a 30-year mortgage at four percent interest today, it will still have a four percent rate when paid in full 30 years from now. These loans are safe in many ways. They allow the homeowner to know exactly how much they will pay every month so that they can budget properly through the years. An adjustable-rate mortgage often looks better at first glance. The initial interest rate is sometimes much less than a fixed-rate loan. However, the interest rate on these types of mortgages remain the same for a specified amount of time. That means that the rate will change once the time expires. For example, a three-year ARM may have an interest rate of 3.5 percent, but that rate is only good for three years. After the teaser rate time ends, the rate adjusts according to the prime rate. If rates are low, you may not see a change. However, if rates rise, you will be paying several hundred more each month on your mortgage. Even with the differences in the two types of mortgages, one is a better choice for your circumstance. Both have aspects that are good and bad. Knowing the pros and cons of each is important when deciding which is best for you. A fixed-rate mortgage is standard and straightforward. What you see is what you get. If you buy a $200,000 home at four percent interest, your payment will be around $1,073.64. Use an online calculator like the one above to find out how much you can expect to pay by using your own variables. The fixed amount remains the same for the life of the loan. The amount applied towards interest and principal will change over time according to an amortization schedule, but you can count on a payment of $1,073.64 per month for the next 360 months, making budgeting easy. Fixed-rate loans are easy to understand and can offer competitive rates. The life of the loan does fluctuate and are now available for 30 years, 20 years, 15 years, and 10 years at a fixed rate. Many homeowners find that longer term loans are more affordable when compared to short-term fixed loans. Payments are less each month, making it easier to afford monthly bills. If you can afford a shorter term fixed loan, the interest rate may be less or comparable to many adjustable-rate mortgages. Your credit rating will influence your interest rate. However, less than perfect credit often qualifies for fixed-rate loans. Non-traditional mortgages, such as FHA, VA, and USDA, are all fixed-rate loans. If you are looking at one of these government-backed loans, the loan will be at a fixed rate. As stated before, the interest rate is at a fixed rate. That means that if you take out a 30-year loan at a current interest rate, it will stay at that rate for the life of the loan. The fixed payment is great as long as you buy in at a low-interest rate. If you happen to enter the market when rates are high, you will pay a lot more over the life of the loan if you do not refinance when rates drop. For example, in 2009 the interest rate for a 30-year fixed loan was around 6 percent. The fixed rate seemed great at the time because it was lower than the 8 percent of a few years earlier. Then the recession hit. The economy and the housing market crashed, causing interest rates to drop for the next few years. Rates dropped to around 4 percent for a 30-year fixed mortgage. People who purchased homes through fixed-rate mortgages prior to 2009 had to make a choice. Either they continue to pay more than necessary over the life of the loan or refinance. With the more stringent guidelines in mortgages, many homeowners no longer qualified for a mortgage. The ones who did qualify and chose to refinance paid closing costs for the option. Closing costs can be several thousands of dollars. Granted, this was not a usual circumstance, but it is a lesson in fixed-rate mortgages. If you decide to finance with a fixed rate, it is best to finance for a shorter period if you plan on staying in the home for more than 10 years. If your home is a stepping stone until you can afford a larger home, you will be okay with a traditional 30-year mortgage. One of the reasons adjustable-rate mortgages look so good is that their initial rate is set under prime, and they generally allow the borrower to qualify for a larger loan. The amount is a fixed rate for a specified number of years. If you are purchasing a home as a stepping stone and do not plan to keep the home for longer than the time of a fixed rate, these are great loans. Adjustable-rate mortgage loans have several fixed-period options. The less time the loan is at a fixed rate, the better interest rate that you receive. Currently, a common ARM is fixed for 3 years, 5 years, and 7 years. This means for that fixed amount of time, you know exactly what your payment will be and can budget accordingly. Another good thing about an ARM is that the interest rate cannot adjust too high too quickly. Structured adjustment gives a homeowner time to either sell or refinance at a fixed rate if the adjustable rate gets too high. Also, these loans have contracts that tell the homebuyer how much their ARM can adjust after the fixed-rate period. If you save for the worst and hope for the best, you are not caught off-guard. The biggest downfall for an adjustable-rate mortgage is how they fluctuate once they adjust. Adjustment rates can vary as much as six percent at the first adjustment. The amount of fixed time associated with an ARM is key to understanding how erratically an ARM can adjust. For example, a three-year adjustable-rate mortgage will only change by two percent maximum at the initial adjustment period and can never go more than six percent higher than the initial interest rate. That means a three-year ARM at 3.5 percent interest today can never be more than 9.5 percent during the life of the loan. Seven years is the longest fixed period for an ARM. Because of the long initial period, the adjustment after the fixed rate expires is harsh. You could initially see an increase of 6 percent in the first year. That means a $200,000 loan at 3.9 percent could initially be $943.34 for the first seven years, but once the fixed period expires, your monthly mortgage could be $1,740.38. As a rule of thumb, the initial amount that an interest rate can increase after a fixed period ends varies. After the first adjustment, they can only increase two percent annually. The maximum adjustment for all ARMs over the life of the loan is usually not more than six percent from the initial rate. Even though these loans are great for homebuyers not expecting to stay in their home for more than the term of the ARM, you should not count on that fact. If your ARM fixed rate expires during a buyer's market, you could end up not being able to sell to avoid the variable rate. Both fixed-rate mortgages and adjustable-rate mortgages have their advantages and disadvantages. If you can avoid entering into the adjustable-rate period of an ARM, they are great loans. You can afford to borrow more, and the initial interest will be less than prime. On the other hand, if you plan on staying in your home for a long time, a fixed-rate mortgage is a good option. These allow you to budget monthly for the life of the loan without the worry of a balloon payment or increase in your monthly payment. Fixed-rate mortgages are especially great when interest rates are low. However, if interest rates are high and expected to drop soon, an ARM or a shorter term fixed-rate loan may be the best loan for you. If you are still confused as to which mortgage is best for you, speak to a financial advisor. They can help you decide your best option after going through the variables of your circumstances.